We published the releases on our Conferences & Exhibition Releases Section . We published each of these releases as the embargo was lifted over the first three days of NI Week, this by now traditional event in National Instruments calendar. We were unable to attend because of the costly 7450km (ca 4630 miles) of ocean and land between your humble correspondent and the excitement of downtown Austin! However all was not lost as we were able to follow the excited and exuberant tweets (#NIWeek) from an assortment of NI Nerds, Geeks and others whose excitement and enthusiasm virtually oozed from each of the 140 characters! There were also some official and semi-official blogs and photos to catch. Hopefully we will capture some of the flavour of the event here. One of the speakers (Intel’s Stewart Christie) says “‘Tiny Robots Helping Tiny Robots Is an Adorable Thing,’I need a set of these for my #NIWeek talk!” And one of the applications in test: “Optimations’ writing water wall powered by LabVIEW is going to be at #NIWeek! Can’t wait to see this app in action!” The build-up the previous week is almost as busy as the actual event itself. Even people (like yours truly) who couldn’t attend contributed “Have fun at niweek, everyone! Recovering from illness for me this year… maybe next time….” and Todd Sierer (remember him and his nerdy videos! 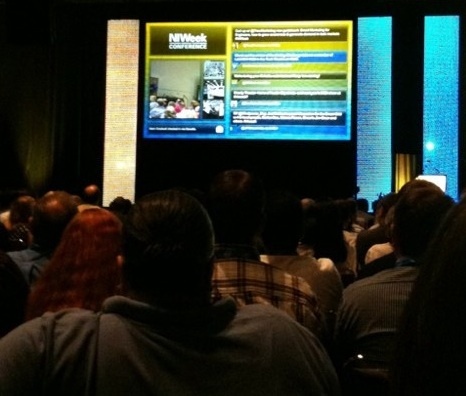 ), “Best of luck to all my friends putting on #NIWeek 2011!!! I know it’ll be the best one yet!” Like I said the enthusiasm is infectious! This piece will concentrate on what was available by tweet as the event progressed. The content was recorded elsewhere (including very excellent videos) and we have links to these resources in the box below. The programme shifted then from student to storm research Innovation. We might say that things started blowing up a storm, with the keynote, Stormchaser Tim Samaras “chasing Tornadoes for Science… for Science! And fun.” Judging from the tweets on this – they almost exploded the feeds on this computer – this was a breathtaking and riveting performance by all accounts. The tweets too were sometimes graphic if not downright esoteric like “We can can measure tornado speed in cows per minute,” or “I’m getting paid to listen to a guy from Storm Chasers give a talk right now. Best job change ever,” or “Watching the most amazing tornado footage I’ve ever seen.” The speaker is quoted “I love lightning, Phantrom 7 high-speed camera captures naturally produced lightning strike. I want images, not cartoons.” And so it went on. I guess the best and most appropriate comment was “The Thursday keynote of #niweek always blows me away.,” (so good we retweeted that one!). As we have said in other places these events serve many purposes and networking is one of these. You have a priceless opportunity to meet your peers, possible future and/or past employers, technical geniuses, brilliant inventors, truly great leaders and a whole gamut of humanity which share this common interest with you. And of course there is a fun side. “Ready for the #NIWeek conference party at the Moody Theater? Fun starts at 7; buses from conv center run 6:30-11:30” It looks like a fun happening! However @jaegen tweets some drawbacks in the new Labview 2011 on Wednesday night, “NI Week party / proves that LabVIEW cannot teach / engineers to dance…” Well R2D2 was not really noted for his dancing ability! Another ruefully comments, “My goal tonight is to spend more time hanging out at the #NIWeek conference party than I did trying to find a parking spot for it.” So Austin is just like most cities then! And other tweets we will probably ignore include “Norm and I at #niweek Wed night“ and other shots of participants in greater or lesser states of enjoyment – I nearly said inebriation but I’ll spare you! Suffice it to say that a good time appears to have been had by all! AutomationWeek also provided links to videos used during the event. This entry was posted on Monday, August 8th, 2011 at 8:12 am and is filed under Automation, Events, Measurement, Research, Technology, Training/Education. You can follow any responses to this entry through the RSS 2.0 feed. You can leave a response, or trackback from your own site.